The Rice Northwest Museum of Rocks and Minerals in Hillsboro, Oregon, is apparently a popular target for criminals. The museum has already been robbed once, and a second robbery was just foiled by a very smart police dog. 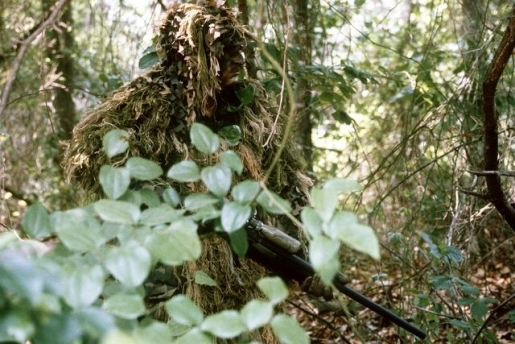 Gregory Liascos was completely camouflaged by a ghillie suit (a suit designed to look like ground and shrubs), thus evading the watchful eyes of the police. Unfortunately, you can’t hide your scent. A police K9 unit uncovered the camouflaged criminal when a police dog bit the ground and it cried out in pain. The 36-year-old Liascos, of Portland, Oregon, is charged with burglary and criminal mischief. Police were alerted when a caretaker discovered a hole secretly cut into the wall of an exterior bathroom on Wednesday. Police put a silent alarm in the area of the hole, and when Liascos showed up to break in and make off with the museum’s collection of gold nuggets, cops were waiting to capture him. If only he could have squashed his pain reflex or sprayed himself down with bear scent, he might have gotten away with it. Maybe next time. He was obviously a very well-prepared crook, but the dog’s nose was a little bit better.